How Long Does it Take to File an Ejectment? MarkCopoulos Oct 2, 2015 Legal Updates Comments Off on How Long Does it Take to File an Ejectment? Short Answer: Four to Nine Months Depending on Whether the Ejectment is Contested. Ejectments in Philadelphia: Ejectments are a growing area of law in Philadelphia. Increasingly, properties are being purchased at Sheriffs Sales for 60-70% of their actual value. For Millennials, the main advantage may be ownership at a cost effective price. Immigrants may see an opportunity to obtain rental properties at low cost. Young entrepreneurs are flocking to these sales to get great potential values. They purchase the property and rent it. Alternatively, the buyer may purchase the property with intent to sell at a 30-40% profit gain. There is one problem. Many of the properties purchased at the Sales have squatters. The squatter may be a former owner who has defaulted on their mortgage, or failed to pay taxes. He or she may also be a former tenant who is taking advantage of the situation. Sometimes the squatter is experienced in these matters. They play the law in their favor to hold possession as long as possible. Squatters may foil the purchasers right to possession by filing a petition for redemption or motion to set aside the sheriff sale. It is important to understand that properties purchased at sheriff sale are not without risk. Many judges in Philadelphia liberally construe the laws to favor dispossessed owners and squatters. Therefore, if the prior owner / squatter in a sheriff sale property is challenging you it is critical you get an aggressive attorney to defend your investment. If you have purchased a property at Sheriff Sale, the first step is to make sure it is clear for use. At the Law Office of Mark D. Copoulos, we file ejectments to clear your right to possession. After possession is granted, the Office of the Sheriff of Philadelphia (the same person who sold you the property), ejects or locks out any would be squatters. Those who refuse to leave are locked up. The effect of the ejectment is to add thousands of dollars of value to a property where possession may have previously been in dispute. The length of time to process an ejectment is highly dependent on the squatter resistance. If the squatter does not answer the complaint or file anything with the court, a realistic time frame is three to four months. However, if the squatter exercises their rights and obtains counsel the time frame may easily rise to six to nine months, or in some cases even longer. If you have purchased a property at Sheriffs Sale, and want to enjoy its full value, contact the Law Office of Mark D. Copoulos to file an ejectment. We file the ejectment at the Earliest Possible Date (“EPD”), thereby ensuring that unwanted squatters are locked out of your property as soon as possible. Once locked out, the squatter cannot return to the property without being being locked up. 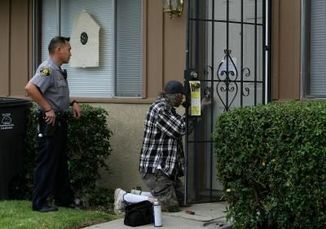 After posting of the Writ of Possession (i.e., the lockout), any subsequent attempts to enter the property may result in Criminal Trespass charges against the squatter. Before filing an ejectment you may also want to consider an eviction if the squatter has signed a lease in the past, or is willing to sign a lease. Evictions are faster and less expensive than ejectments, generally taking approximately forty-five days to finalize. You may also want to consider negotiating with the squatter a “cash for keys” situation wherein the squatter agrees to remove all belongings and vacate the premises in consideration for a one-time payment. Any terms of the “cash for keys” agreement should be memorialized in a legally binding settlement and release. Speak with a Philadelphia Ejectment lawyer about drafting such a document. Do not delay any longer. Make that property you purchased more valuable. Secure title and take possession. Call now for a free consultation: 267-535-9776.